Beaver and Bulldog is a popular sports pub and wingery situated at 195 First Street, right in the heart of Collingwood. They call the restaurant an evolution of the pub, which sounds just right with the food options they offer. In addition to full-bar beer, alcohol, and shake options, you are free to choose from an array of lunch and dinner food options. Every Tuesday is wing night with generous and budget deals on wings and shrimps. You can eat all you can, for just $1.10 per wing and $0.9 per shrimp. Also, every Friday and Saturday is Prime Rib Special day. Best known for their wings and an exclusive range of bar options, you can also choose from a diverse menu, offering local, Canadian, and British cuisine, with a lot of vegetarian options. Other than their well-known chicken wings available in wide range of flavours (20 in total), some other favourite food choices include fish & chips, British bulldog burger, baked macaroni, Canadian ski club, caesar salad, steaks, nachos, and kidney pie. The food is not the only thing that makes Beaver and Bulldog one of the finest dining options in Collingwood, but their atmosphere and service are also well praised. With a nice location, plenty of parking space, affordable prices, multiple large-screen TVs, free Wi-Fi, and staff that is helpful, you can find this place fun that offers comfort and relaxation. You can enjoy your drinks and food indoor, or choose well-decorated patio for an open-air experience. Remains open seven days a week, from 11 am to 11 pm on weekdays, and till midnight on weekends. Both indoor and outdoor seating options are available. Most customers on different review sites praised the portion size and rated it as generous and fulfilling. Wing nights are often crowdy, so you may have to wait if not have a booking! Expect slow service during the busy hours. Owned by Amanda and Brandon Biggs, Beaver and Bulldog have evolved into one of the most well-known restaurants in Collingwood in the last decade. 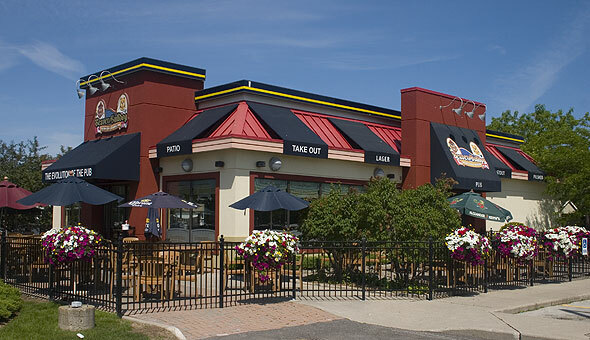 First opened in 2003, the bar quickly established itself as the best place to have buffalo wings. With the range of Canadian cuisine, cooked with an infusion of British flair by their chef, Mike Schut, you can find their food unique and refreshing. Beaver and Bulldog are rated as one of the best restaurants in Collingwood for its food and ambience on TripAdvisor. Ranked as 11th out of 78 Collingwood restaurants listed, the sports bar also won a certificate of excellence from 2015 to 2018, for four consecutive years. If you are visiting on wing nights, it is better to book your place in advance if you want to avoid waiting.